Sunday was kind of a slow and easy day for us. We had nothing in particular planned. We got up, had coffee at home and then headed out. Our one mission for the day was to pick up two pies for our friends Fred and Delfina and their daughter Amy and family. We went back to the scene of my cherry strudel indiscretion on Saturday, Diane’s Bakery at the Hub. We got an apple pie and a blueberry crumble pie. They were still hot when we picked them up. We’ve had their pies before and know that they’re delicious. We brought the pies back to the house to cool, then went back down into town. Everything is so close here, it’s no big deal to have to make two trips like that. We decided on lunch at Wrangler’s a restaurant we’ve tried it before and always liked it. We were rather early and the sign on the door said they opened at noon on Sunday. Lucky for us, this was the first Sunday they were opening at 11am. This is the kind of place with peanuts on the table which can be a problem for me, but I think I kept myself under control. 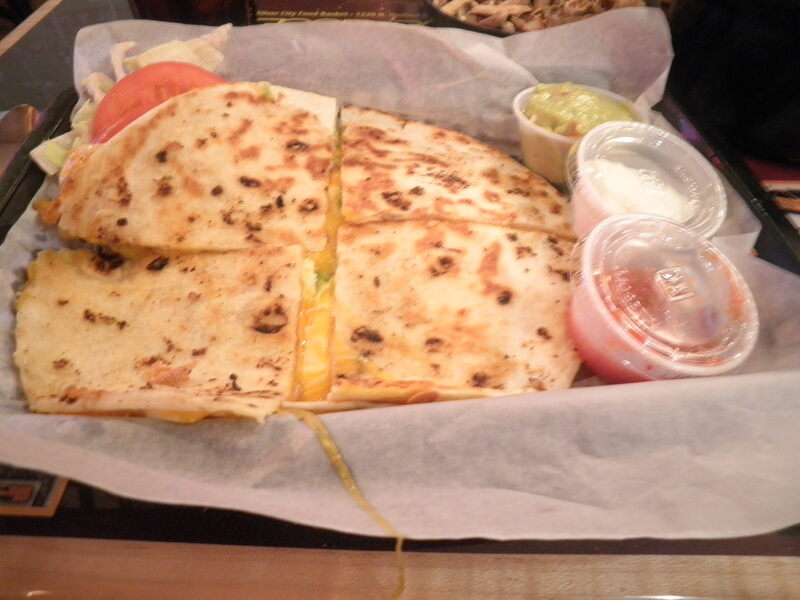 My choice was actually from the appetizer menu, green chile and cheese quesadilla. Served with sour cream, salsa and very tasty guacamole. It was huge for an appetizer and I had a hard time finishing it. Very good. We came back to the house with relaxing on our minds. We called Fred and Delfina to leave a message that we’d like to stop over and we then spent most of the afternoon, walking around the property and resting in the shade of the garage. We’ve found some interesting rocks on the property, many yuccas, some cactus and several agave plants. We often talk about the fact that when we get out here we’ll never have to cut grass again, we’ll only need a weed wacker! I’m looking forward to that plus a million other things. 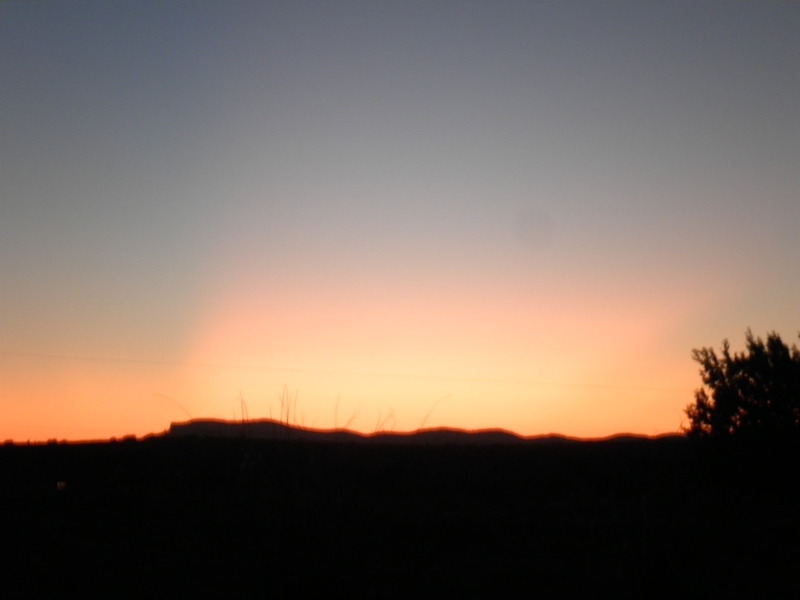 It was a glorious day out and from the first light of day. There wasn’t a cloud in the sky and as we sat there we marveled at the beauty of this spot. As always wondering whether we’ll ever take it for granted. We heard from Fred and Delphina in late afternoon. We packed up the pies and headed to their house which is just a little over a mile from our house. Delphina is a fabulous cook and makes all of her New Mexican specialties from scratch. As we sat and talked, she tore tortillas and made her own chips. I realized during the trip that as of September 9, it had been 6 months since I’ve had chips. I’ve been able to keep to that throughout the trip. I didn’t take a photo, but I justified eating a few of them because they were tortillas first, before they hit the oil. I couldn’t say no to her, she was making them for us. They were delicious and the really delicious thing was the homemade salsa she made. She’s promised to teach me her recipes when I move out permanently and I’ve promised to teach her to make scones. Burritos were on the menu. Amy cooked up the veggies and chicken and brought it over from her house. Delfina had made Spanish rice. I had a burrito with sautéed onions, green and red peppers, fresh tomatoes and cheese with some rice on the side. So good!! Everything homemade. I WILL learn to do this all when I move out here! 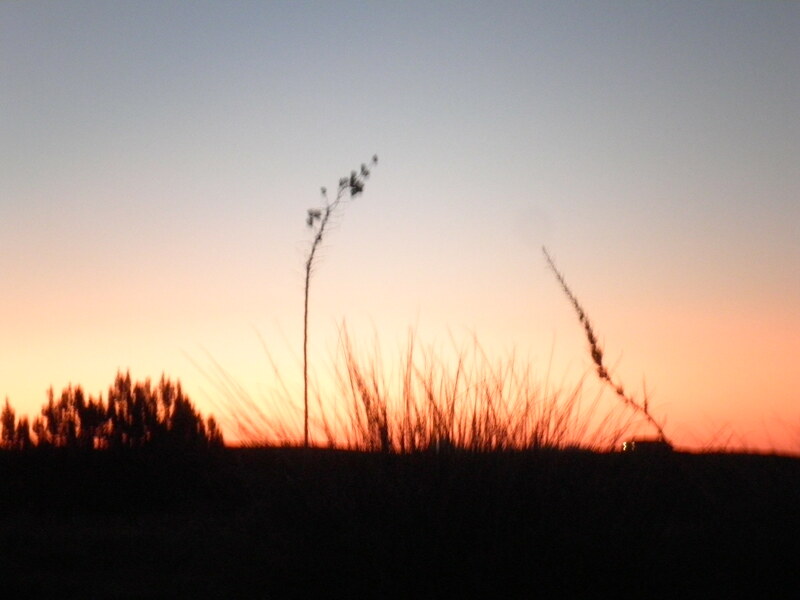 Another beautiful start to a beautiful day in New Mexico. Boring, I know. I’m ready to be here, all the time. This post is making me crave mexican! 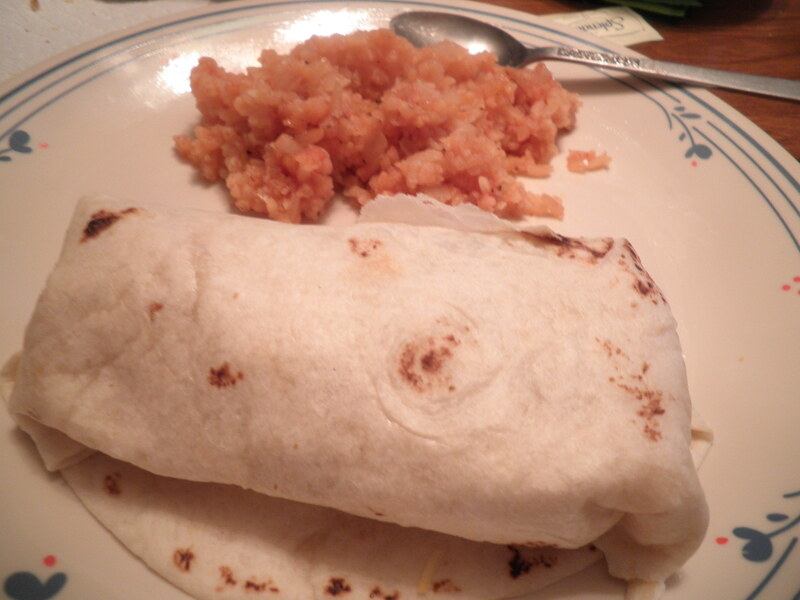 i haven’t had a good burrito in ages… Now I’m dreaming of guacamole and homemade salsa. The salsa especially was so yummy. I can’t wait to get the recipe to share it and to eat it! !